DECEMBER 13--While all sorts of stuff has been thrown by enraged motorists through the drive-thru window, it wasn’t until last week that someone got arrested for heaving a dead squirrel at a fast food worker. 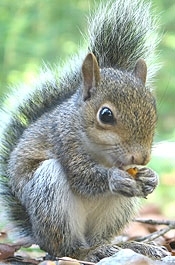 A Bartonville Police Department investigation determined that the deceased squirrel had been placed on the dash of Thompson’s vehicle “as a prank” by a friend. Instead of disposing of the animal, Thompson, pictured at right, left the dead squirrel inside the vehicle when he went to Hardee’s, where the “2/3 lb. Monster Thickburger” will thicken your arteries. A Hardee’s patron, going beyond the call of duty, removed the animal and placed it in the snow outside the eatery (where the police later snapped several evidence photos, which can be seen here). 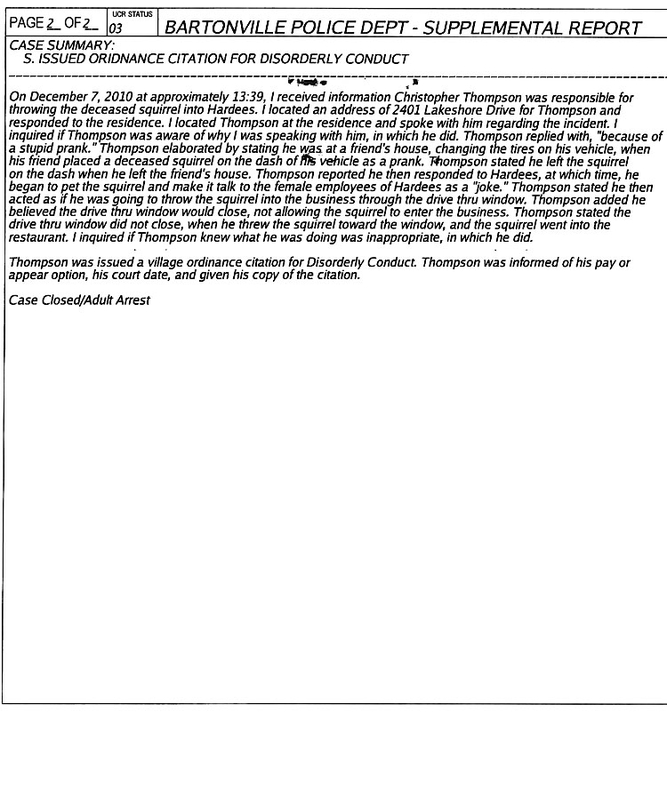 When a cop interviewed Thompson last week at his residence, he confessed to the “prank,” claiming that he thought “the drive thru window would close, not allowing the squirrel to enter the business.” Thompson, police noted, was issued a village ordinance citation for disorderly conduct. Submitted by harryteehan on Tue, 2011-03-01 00:53. Submitted by Facts on Tue, 2010-12-14 19:52. @RLWieneke? Really? Dead animals carry germs? So do live animals..... Did you really think Hardees wasn't in the business of serving dead animals as food? Submitted by rlwieneke on Tue, 2010-12-21 22:33. To: Facts I'm so glad I have this opportunity to educate the uneducated. Here is a new concept for you: "Processed Meat", "Refrigeration", "Proper Cooking". These are all methods used to insure disease is not spread, A dead squirrel laying on a drunks dash in his car is not a healthy thing to keep around. If you think it is, why don't you find a dead animal and leave it on your car dash for a week or two. Submitted by Chris Payne on Tue, 2010-12-14 16:00. 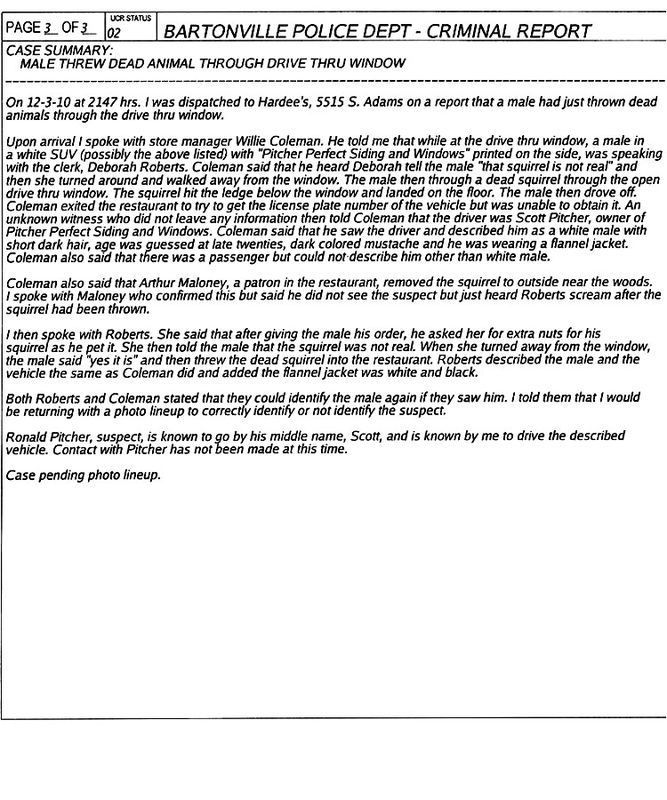 "The male then through a dead squirrel through the open drive thru window." That's a lot of through/threw/thru's. I can see how you botched the spelling ociffer. Submitted by rlwieneke on Tue, 2010-12-14 14:23. From the looks of most of the comments the majority of you regardless of your age are no better that this beer guzzling idiot that threw the dead squirrel. If it was up to me, the lot of you would be isolated in a society separated from normal people where you could commit acts like this to your hearts content and suffer the consequences of your actions with no protection from the "adults". Consequences?, what consequences? We have health laws is this country, A dead animal carries germs and disease and you idiots would be the first to scream if it was you who got sick from contamination at a restaurant. Submitted by momsaid on Tue, 2010-12-14 10:28. Did she want fries with that? Submitted by ddav on Tue, 2010-12-14 06:21. Will he be known as the Squirrel bomber? Submitted by lionfour on Tue, 2010-12-14 03:17. Submitted by slyfed on Wed, 2010-12-15 16:09. Your comment tells a lot about your character. Submitted by nunh on Wed, 2010-12-15 16:41. So does yours - lame *ss weiny. Submitted by Facts on Tue, 2010-12-14 03:11. "Police Chief Brian Fengel said his department takes incidents like this seriously, adding that such behavior would not be condoned in the Peoria-area village (pop. 6310)" ------------------------------- I'd say Bartonville PD has way too much money in its budget if its got its 12 officers spending even a second of their time tracking down squirrel crime? I'd be willing to bet this Police Department buys brand new cars every three years or when they hit 50,000 miles. So much money is wasted by Bartonville PD, its time the city took a look and cut some of the waste. Submitted by chi_sam on Mon, 2010-12-13 23:54. Submitted by a_patriot on Mon, 2010-12-13 21:58. Submitted by jtex on Wed, 2010-12-15 14:28.
wELL of course HE threw IT IN. iT WAS dead. dO YOU THINK IT WAS GOING TO SKIP THROUGH THE WINDOW UNDER ITS OWN POWER? i REMEMBER WHEN THE mo OF 3/4THS OF aMERICANS WASNT to get some self righteous, manufactured-rage AND anger and call the self righteous, manufacturing-rage cops for every stupid little event in life. gROW UP, PEOPLE, RUNNING TO THE TEACHER IS SO FIFTH-GRADE tHERE, FIXED it for YOU!!! 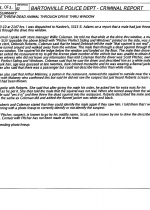 Submitted by Airdoc on Mon, 2010-12-13 21:32. He is definitely a squirrely nut. Submitted by Jamesb on Mon, 2010-12-13 19:45. Look at the photo of the "defendent" - his photo speaks VOLUMES about the personality and kind of stand up "guy" we're dealing with here - he's a little punk - all the way. Submitted by nunh on Wed, 2010-12-15 16:42. Lol - you need to sit back and smoke some reefer man - lighten up giryl man!